I heard of the 1. mai treff for Volvo Felt on the Norsk Volvo Felt-register1 and decided it was definitely the place to go. 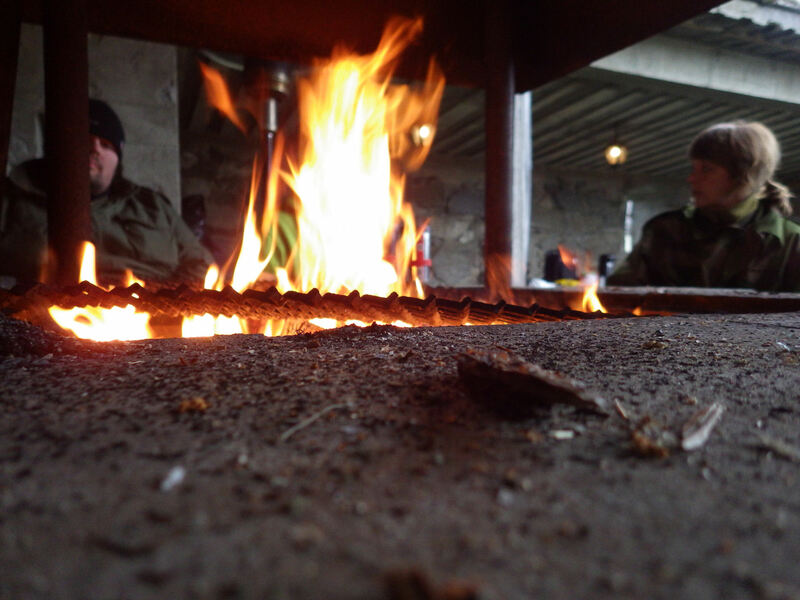 The plan was to drive down to one of the Rakkedstad gas stations, leave from there as a convoy through the city, stop at the local Resistance Museum for a commented visit, and then finally go to the camp to eat and discuss around the fire. The previous years had seen up to 15 vehicles, so the odds were good that I would had ample possibilities discussing the vehicle and the various problems we had. Unfortunately it was one of these cold, wet and windy weekends so there was definitely not many people and some decided to leave early. I knew our car had some problems2, so I decided to take it easy and leave early, using the scenic route. Since Miriam was on a business trip, I had bought a Dashboard Camera to capture the whole trip... but for some reason it did not work3 when I start it up so the entire journey went unrecorded. I still somewhat managed to arrive first at the gas station, perfect opportunity to get something to eat and some warm beverage while waiting for the others. 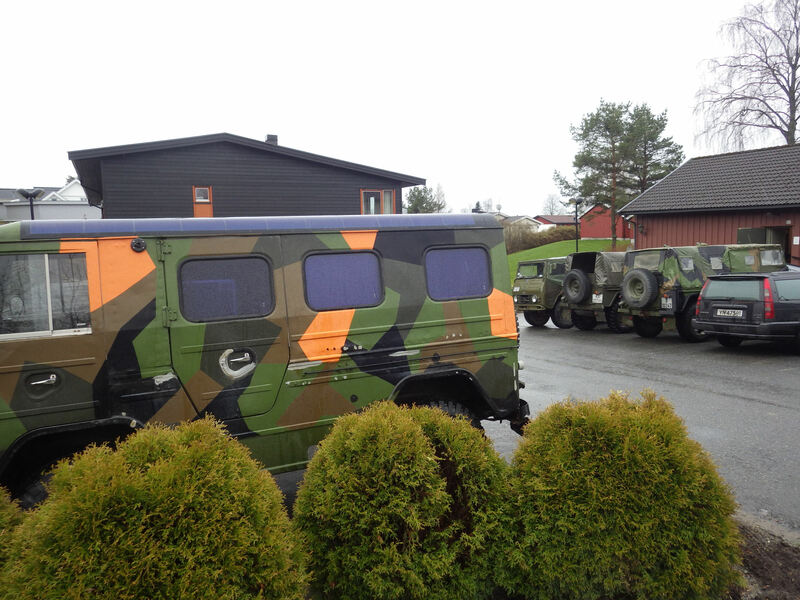 Eventually other Volvos arrived, as well as a big4 American GMC military truck. While waiting for late comers we exchanged presentations and discussed our various vehicles, ours definitely drew some attention thanks to the very large orange spots and shiny solar panels! 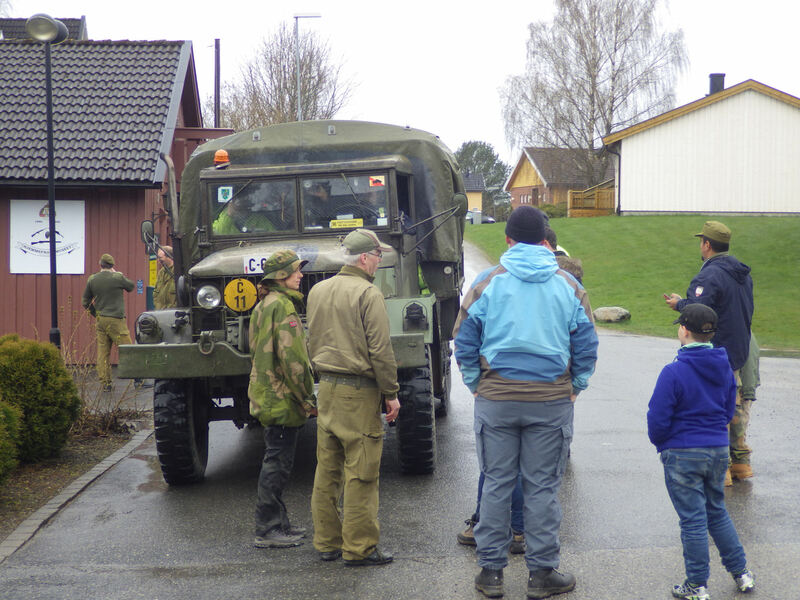 We eventually started as a convoy, headed into Rakkestad, and after a while we parked close to the Hjemmefrontmuseet. 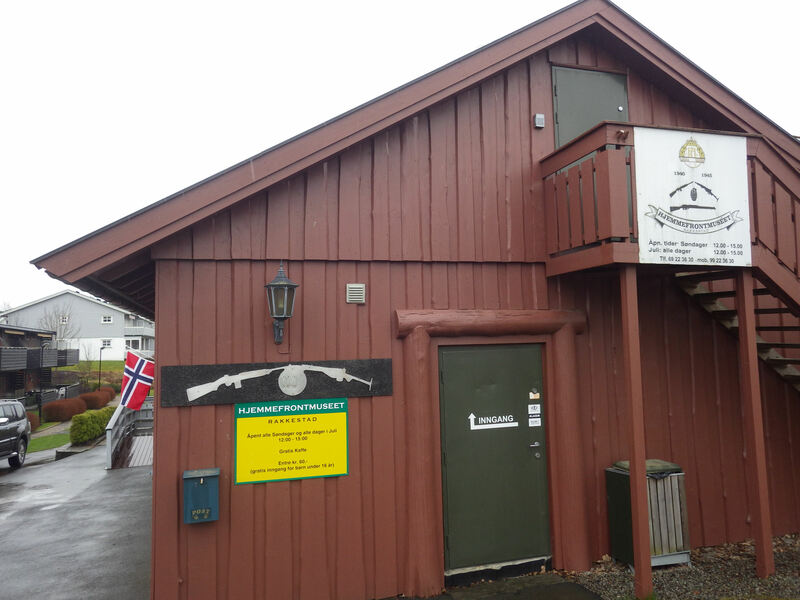 The museum is quite small, but they have quite an impressive amount of things exposed, including uniforms and weapons that have been given to the museum by few war celebrities such as Max Manus or members of the royal family. There was some very interesting explanations of how allies supplied weapons and equipment using parachuted canisters (they had few of them in display), modified steam containers to hide contraband on cars, radio systems, and some impressive ammunition used by the rail based canons used by the German army. 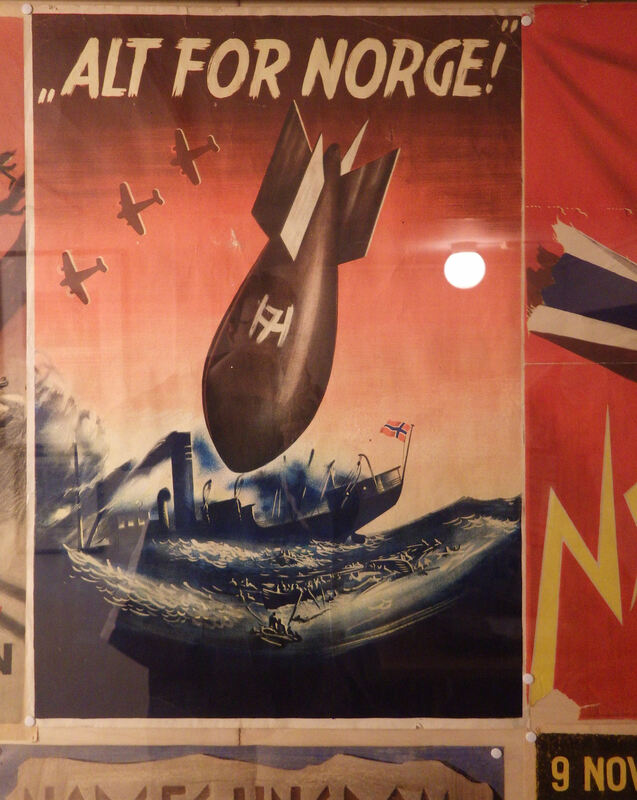 I also did like the large amount of posters, letters, new papers, various official documents, as well as the presentation of the equipment used by the troops of each country. All in all it was quite interesting. I just wish my understanding of spoken Norwegian had been better, I did not understand much of what the museum curators were saying! After the visit, we moved again in convoy formation, and headed toward farm buildings on the outskirts of Rakkestad. We somewhat managed to park without too much of a mess despite the slippery mud all over, picked up our food and drinks, and met again with some partial protection from the elements in what looks like a cross between a sniper nest and a miniature fort. I can honestly say that I spent most of my time there at a very short distance from the fireplace: If I had know I would have taken my winter equipment because it was very cold, very wet and very windy. At this point we were less than ten persons remaining, but some pretty interesting stories were told, and many interesting information were collected, as well as a promise to look at my transfer-box adjustment settings on the morning. I also received a number of SMS and phone calls because of something having broken at work, but without any way to connect to the computer network there was not much I could do, except going home early... which I refused to do since I had a number of beers during the evening. That's a good thing because there was a fair chance that I had ended up in a potentially dramatic "pole vaulting" accident. I spent a nice and comfortable night in the car, and after a quick breakfast we started to look at my transfer box problems. Terje got his hands dirty looking under the car, and he found out that the transmission selector level was not correctly setup, and that indeed I had driven all the way from Oslo in four wheel drive mode instead of just back wheels... which is a no-no. It's purely designed for mud, snow, sand, or any other situation where the wheels can easily spin and drift, else the front differential and axles get damaged. Half an hour later all was fixed, and after packing my stuff I was on the way out from the farm when I noticed some clickety-clickety-clock sound. 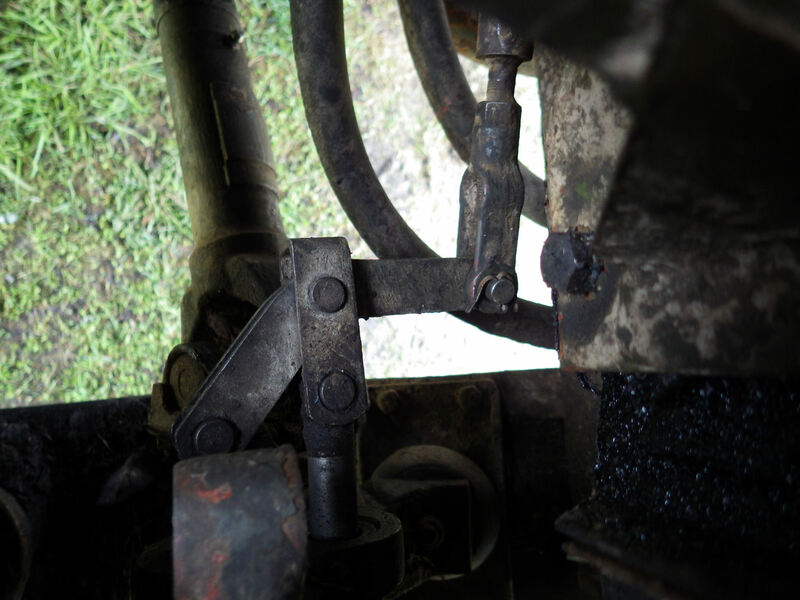 I asked Per to help me find what the problem was, and he quickly found out that the noise seemed to come from the from universal joint on the front axle. After stopping the car and looking under it became obvious that there was some abrasion marks on the differential. 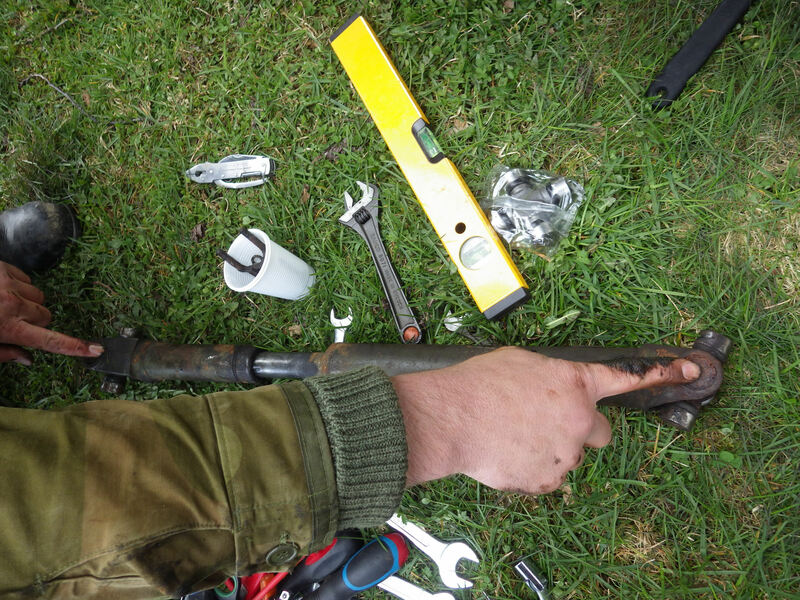 Ten minutes later the axle was removed, and the culprit was indeed the universal joint that had broken one of the ball-bearing heads. If I had continued driving, it would have probably completely failed, and the transmission axle would have fallen down and hit the ground forward while I was driving, probably resulting at the minimum in the entire destruction of the gear box, and at worse the car getting out of control and ending up in collisions or roll overs. Guess we will have to fix that.